We’ll show you the touchpoints for awareness, information and purchasing decisions used by your target groups in different customer journey phases. Our 360°Touchpoint method uses surveys to comprehensively measure the use of up to 100 touchpoints by your existing or potential customers. It covers customer touchpoints already managed by your firm, touchpoints used by your competitors, as well as the latest ways to interact on the market. We identify what actually gets to your customers: alongside quantitative reach, we also uncover the qualitative relevance of touchpoints along the customer journey. 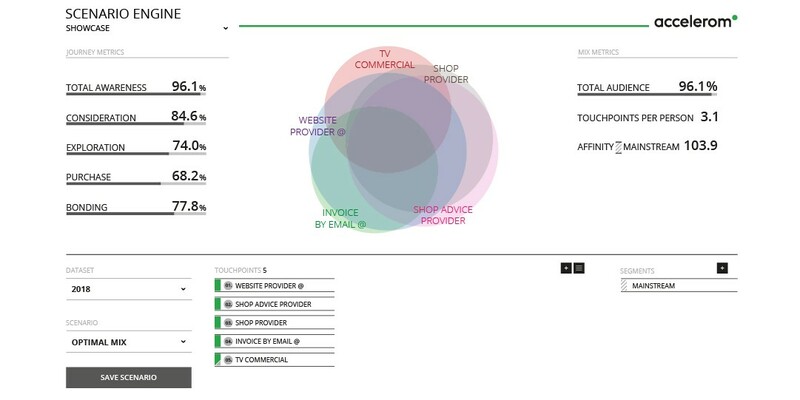 Using a standardized measurement of all touchpoints, we capture and compare data on the impact of online and offline touchpoints, as well as owned, paid and earned touchpoints. We also calculate the total audience (combined reach of different touchpoints), which makes it possible to systematically create and evaluate multichannel strategies. This is the basis for targeted communication and impact-oriented budget allocation. 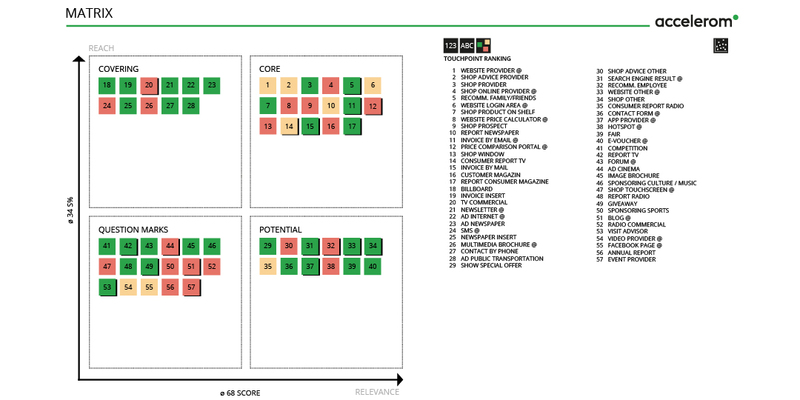 As a result, the number of touchpoints can usually be reduced and their management optimized. The key touchpoints along the customer journey are revealed, so you can design the brand experience here to delight and retain your customers. The phases of the customer journey show at a glance which touchpoints bring different customer segments into contact with your brand as they progress from information seeking to decision making. 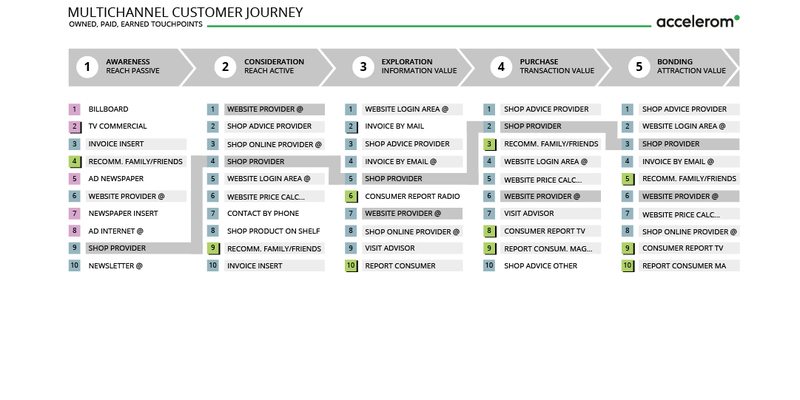 The customer journey for each segment lists the most important touchpoints in each phase. Depending on the target group, country, or product category, the key touchpoints and the customer journeys may be completely different. We measure your customers’ journeys and display them to you on easy-to-understand dashboards. There’s a vast choice of leisure activities available today. 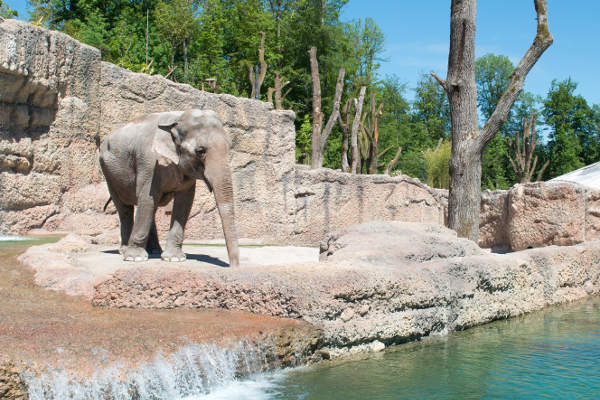 How can Zurich Zoo continue to keep up as an attractive destination? To help with this challenge, Accelerom was asked to perform a new 360°Touchpoint analysis for Zurich Zoo. The focus was on looking at which touchpoints were involved when different groups of people: families with children, grandparents with grandchildren, and Zurich city residents, were deciding where to visit. Additional insights came from an analysis of the pluses and minuses of a trip to the Zoo. The results assisted Zurich Zoo with its marketing planning: communication with its core target groups and potential new customers is now more effectively designed, since the relevant customer touchpoints have been better focused through including more suitable content.